I was recently asked how long the NDDC had been running the “Be Local” campaign and, futhermore, how long we’d been doing some kind of “Shop Local” theme. Well, the first question was easy, we’ve been doing the “Be Local” ads for about two years, they came out of last year’s Abby Erickson and Ally Beyer-led Events and Marketing Committee. These ads are designed through By All Means and published monthly in the Northfield Entertainment Guide. The second question was a little tougher to research; the earliest mention I could find on our website of “Shop Local” was back in 2005. Some of the earliest blog posts were kind of economic advocacy, like America Unchained Day, Shopping Locally Saves Neighborhoods, and the Minnesota 2020 Report. Then I began to focus on Shopping Locally for the Holidays, Supporting Local Businesses, and, uh, My All-Time Favorite Blog Title. Finally, I began to build on the basic theme such as Shop Local, Eat Local, Create Local, Shop Local, Visit Local, Listen Local, and Shop Local, Be Local, Local First. Clearly we didn’t invent “Shop Local”… and Abby and Ally pointed out that there was so much more to do downtown than just shop. Therefore, we started with “Be Local” and then the possibilities were almost endless: Shop Local, Eat Local, Drink Local, Create Local, Listen Local and (for Valentine’s Day) Love Local. “Be Local” has served us well, providing a starting point for inspiration. In fact, if you’ve got some ideas about good things to do locally, let us know and maybe we’ll roll them in to an upcoming advertising piece. 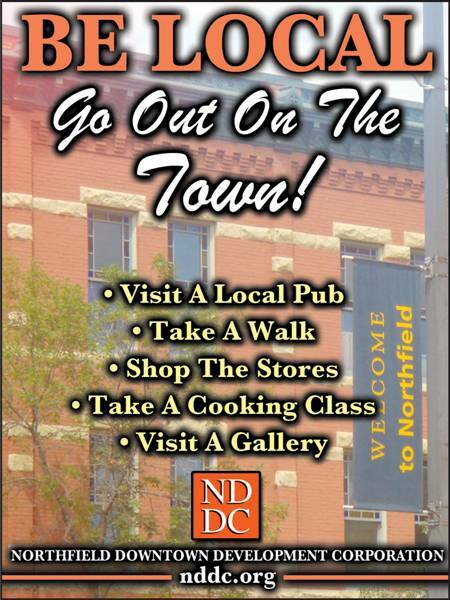 Pingback: Northfield Downtown Development Corporation » Weblog » Be Local…Dine Local!